When did Sanctuary Inn begin? Sanctuary Inn began as an idea for long-term, community based missionary care in 2014. 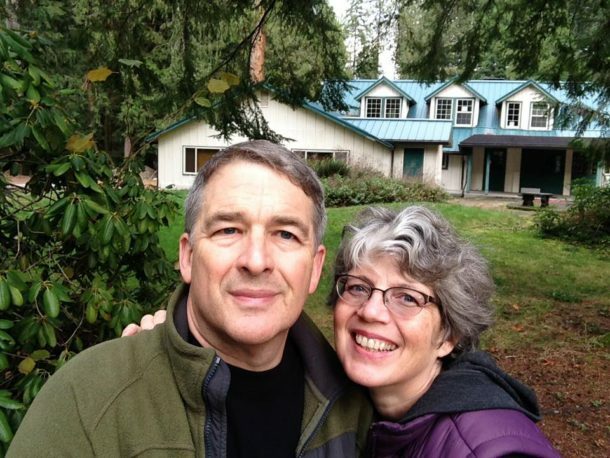 In 2016 we were able to purchase the property we now have in Welches, Oregon (about an hour east of Portland). What kind of facilities do you have right now? The property is about nine acres. About five acres of the property is wooded and easily accessible for walking and exploring. We have a Lodge that is often booked out for weekend retreats but it is also our main kitchen/dining area. Most evening meals are served in the Lodge. We also have the Inn and the Cottage. The Inn has a private one-bedroom apartment as well as an upstairs living space with several bedrooms we use for guest housing. The Cottage has four available guest rooms. The Inn and the Cottage have shared bathroom arrangements and they each have a full kitchen. Who can stay at Sanctuary Inn? Our purpose statement reads: Sanctuary Inn is an intentional Christian community to equip, refresh and restore God’s Global Workers for kingdom purposes. Those we feel called to serve are God’s Global Workers. These are singles, couples, or families that are giving of themselves in a cross-cultural setting; perhaps within the United States but most often, outside of the borders of the US. Each stay requires an application so that we can better serve you. The link to the application is here: https://www.sanctuaryinn.org/apply/ Additionally we can provide retreat facilities for your mission agency, your planning team or church based missionary care team. The Lodge can sleep 36 guests in two bunk style guest rooms. Please email us at [email protected] for more information regarding retreats. How long can I stay at Sanctuary Inn? Many missionary care facilities are limited in the amount of time a guest can stay with them. If a family, single or couple is need of a longer stay their options can be very limited. Sanctuary Inn offers the option of a longer stay for missionaries. Many of our guests come for a week or two but if there is the need to stay for a month or longer Sanctuary Inn may work for you. Because we are still developing our facilities we are offering stays up to a month with the option to stay longer after an evaluation at the end of the month. What should I expect during my stay at Sanctuary Inn? We have a simple intake process in which we will establish with you a care plan with specific goals to accomplish during your stay at Sanctuary Inn. As part of your stay at Sanctuary Inn, you will be expected to have regular check-in sessions with our Care Coordinator to make sure you are progressing on your goals and getting the care you need. These check-in sessions will be 45-50 minutes in length for adults and, as needed, 30 minutes in length for teens. We are currently developing material for debriefing children. At this time we don’t have an “official” debrief for children.